Housebroken: No – I’m working on it! Hi, my name is Bo! If my eyes don’t instantly win you over, then I guarantee my sweet disposition will! I am sweet, quiet boy just looking for someone to love me forever. A home with another dog would make me the happiest. I come alive around my puggie brother and sister!! And I love to play…but I equally just love to lay around. I currently live with 2 other black pugs, a kitty and a 4 year old girl and I love them all! I don’t care for my 17 year old foster brother at all! He scares me! My Mommy thinks that maybe men weren’t so nice to me at one time. I am still working on potty training. I wear a belly band in the house and I am doing a lot better! I don’t have any accidents in my kennel during the day or in the kitchen where I sleep at night (all without my band). My favorite place to be is outside! So you must have a fenced in yard because I like to sit out there for a long time when it’s nice. 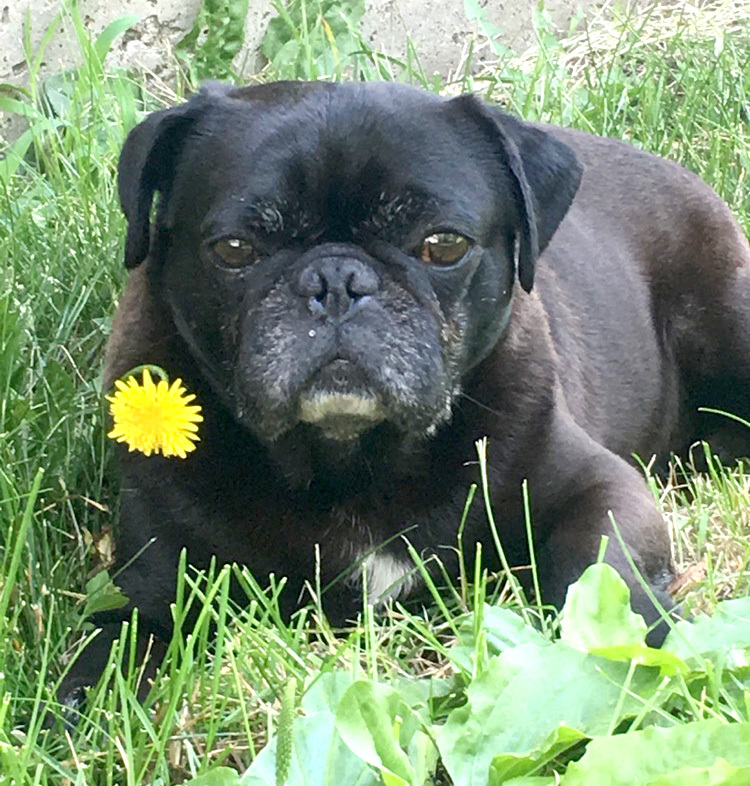 My foster mommy has to coax me in most of the time with a sweet voice-she thinks I was so used to being kept outside my whole life- I didn’t really know life as an inside pug when I first arrived. I am not really a lap dog. I prefer to lay by myself or with the other dogs. But that doesn’t mean that I don’t love attention! I love to have my ears rubbed and I love to be told what I handsome boy I am! No one told me that for a long time! So- that’s a little about me. Will you find it in your heart to love me forever? I am such a sweet little guy, and I just need a loving home to call my own! Interested in adopting? Bocephus’s minimum adoption donation is $325.